It’s called the Valley of the Temples, though it isn’t really a valley at all. It’s a flat ridge on the outskirts of Agrigento, in Sicily. And while the temples are undeniably there, the “valley” might just as well be called The Hill of the Goats. The oldest of the temples have been there since the sixth century BC – and I suspect the goats have too. The temples were built by the ancient Greeks, and the goats may have come to Sicily with the builders, or from Asia with Arab invaders centuries later. No one knows for sure. But the breed is called Capra Girgentana, after the Sicilian name for Agrigento, Girgenti; and you will find these goats nowhere else. 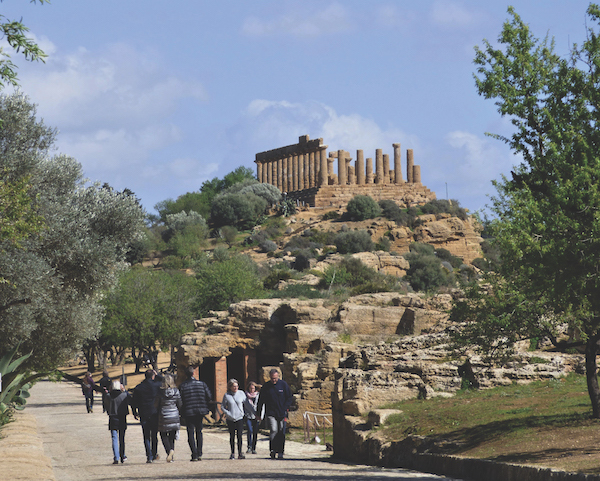 In the past there were 30,000 or more in Agrigento province. They were popular for the high quality of their milk, and for their unique appearance – a combination of the beautiful and the absurd. 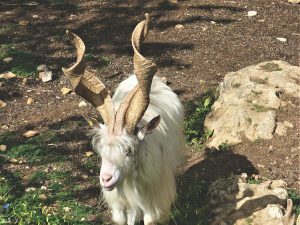 It’s as if nature, having fashioned a handsome creature with long, white fur and a sprightly tuft of hair above a friendly face, suddenly asked Dr. Seuss to design the horns. Because from the head of this benign-looking beast rise two enormous compound spirals of bone, half as long as its body. There are, sadly, only around 500 of these marvellous creatures left. Slow Food advocates are trying to find markets for the milk and cheese, hoping that local farmers will invest in the breed. Besides the captivating goats, you’ll also find thickets of ancient olive trees; and surrounding the archaeological area of the temples there are almond orchards, just beginning to blossom when we were there in early March. 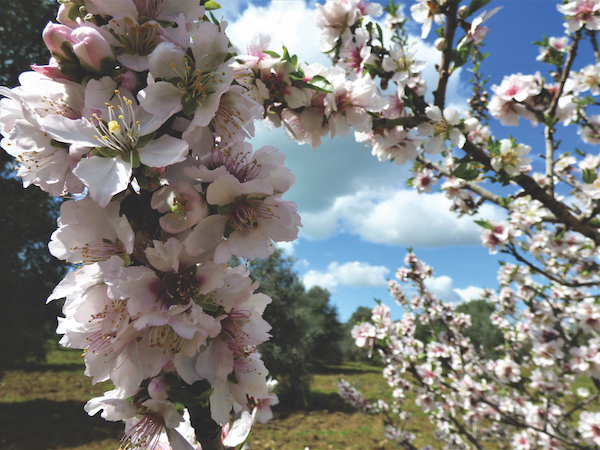 Though we didn’t know it when we arrived, the almond blossoms are the reason for a grand festival in Agrigento called the Sagra del Mandorlo in Fiore – the Almond Blossom Festival. For a time, they had reason for optimism. Under the tyrant Theron, the city became wealthy, by exporting grain, wine, and olives, and by breeding livestock. (Goats, perhaps?) Akragas even minted its own silver coins. But the city eventually came into conflict with the Carthaginians, who, after years of war, sacked and burned the city in 406 BC. After enduring the Punic Wars as a vassal of Carthage, Akragas came under Roman rule in 210 BC, and was renamed Agrigentum. A thousand years later Agrigentum fell to the Arabs, and then in the 11th century AD to the Normans, who found themselves ruling little more than a fishing village. But the temples, though quarried for centuries to build the medieval town, remained. Of the temples, the most complete are the Temples of Concordia and of Hera Lacinia. 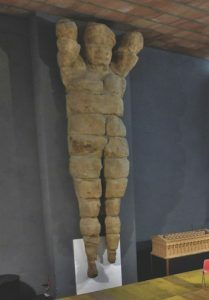 They are similar in design: a central chamber called a cella, which would have held a divinity’s statue, surrounded by a walkway of 34 fluted columns – a peristasis. They are both built on a stepped base with an area about 39 by 17 metres. The Temple of Concordia is mostly complete except the roof, but the Temple of Hera Lacinia has only one complete row of columns. All the rest are missing or damaged. A monument to the Dioscuri – Castor and Pollux – near the ruins of a city gate has only four remaining columns, topped with an entablature probably created in the 19th century from random stones. Here, also, the mystery cult of Demeter and Persephone was celebrated by the women of ancient Akragas. Nearby, two columns are all that’s left of the Temple of Hephaestus, the Greek god of fire. In this area, we encountered 20 or so young tourists with jackets marked “Thailand”, and wondered idly what brought them to Sicily. As we climbed the hill toward the Temple of Herakles, eight standing columns, silhouetted against the blue Sicilian sky, seemed to slowly rise from among the tumbled drums that were once part of the monument. Little of the Temple of Olympian Zeus remains, but it was once the greatest of the Akragan temples – so massive, in fact, that instead of free-standing columns, the roof had to be supported by solid walls with engaged columns and giant human-form statues called telamons. Of the walls, and the telamons, only broken pieces remain. That evening, in Agrigento, we saw a grand parade celebrating the Sagra. Our hosts told us that, every year, the festival features folkloric performers from all over the world – 11 countries were represented this time. The Thai delegation danced past in their exotic and colourful costumes – very different from the young tourists among the ruins. Over the next two days we enjoyed some dazzling preliminary performances but could not remain for the grand finale in the city’s opera theatre. We missed the closing ceremonies at the Temple of Concordia, too, but in imagination I seem to see a goat lift his ornamental head, and prick his ears at the distant music, like an echo of rituals his ancestors heard, long ago.